There is not an ounce of overstatement if you hear: "to travel is better than to arrive." It's interesting how your travel time juxtaposed with new surroundings allows you to discover novelty every time you embark on a new journey. Be it a self-reflection, learning something new either in yourself or in your perspective, there is a feeling of adrenaline rush attached to every trip you take around the world. The road trip from Portland to Eugene is a stretch of 112 miles filled with small towns and villages - the scenic beauty along this road ranks it as one of the most beautiful countrysides in the world. 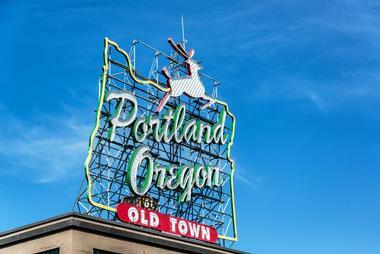 One can find frequent flights from Portland to Eugene from Portland International Airport (PDX), the leading airport in the state of Oregon, United States of America. 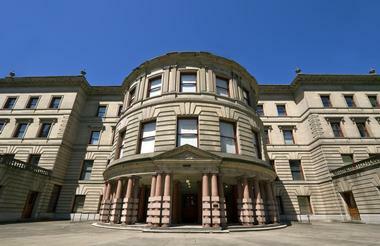 It is located within the city limits of Portland, towards the south of Columbia River in Multnomah County. The airport accounts for 90 percent of passenger traffic and more than 95 percent of air cargo in the state of Oregon. 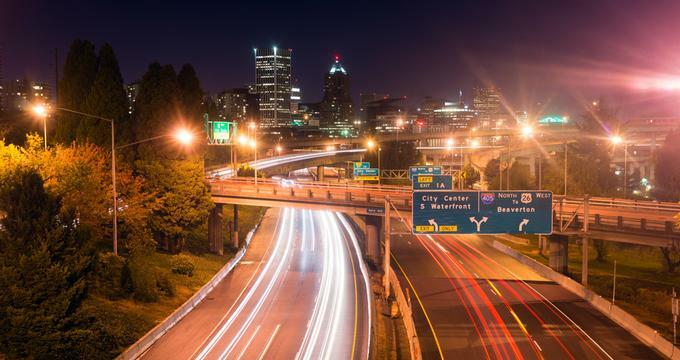 A 2013 poll revealed PDX to be the best US airport for its upkeep of time, dining options, shopping and connecting options from the airport to the main parts of Portland. Further, the airport's geometric-patterned carpet has gained much media attention for its symbolic representation of north-south runway intersection as witnessed by air traffic controllers at night. 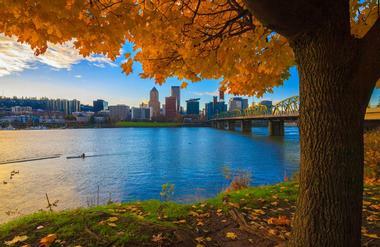 Alaska Airlines offers nonstop flights from Portland to Eugene that reaches the destination in 35 minutes. A one-way single trip ticket costs an average of $ 210 with varying prices that depend on when the ticket is booked. Airline service providers like American eagle, United and Delta offer connecting flights from Portland to Eugene with layovers ranging from 5 to 9 hours. Amtrak, USA and Canada's leading railway provider, links Portland Union Station and Eugene–Springfield station via some of the most scenic backdrops. The train offers carry-on & checked baggage options when travelling from Portland to Eugene along with traveler facilities that include in-house lounge facility, Wi-Fi and onboard wheelchair ramp. This route has the facility to reserve bicycle spaces for which a traveler is required to buy a separate ticket. Amtrak’s Cascades offers reserved coach seat and business class seat for travelers on this route while their Coast Starlight train offers an additional seating experience; Superliner Roomette, a sleeper coach that is suitable for 2 travelers. The roomette contains reclining seats that can be converted into comfortable beds. The reserved coach seats are appropriate for short travels while the business class seats are comfortable enough to catch up on work while on the go. The journey via train takes around 3 hours and the tickets range from $ 28 to $ 250 depending on the choice of seating. 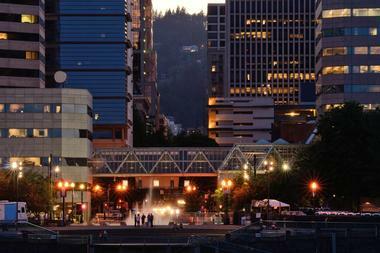 Both Amtrak and Greyhound provide bus service between Portland and Eugene. The road journey takes around 3 hours and the ticket prices range from $ 8 to $ 50, with special discounts offered for tickets purchased online. The buses are Wi-Fi enabled, individual power outlets are provided for every seat that offers extra legroom to ensure comfort. The bus journey on Amtrak offers reserve bicycle spaces for travelers who wish to carry their bike with them. Since Eugene is a city that has well connected bike lanes, you don’t want to miss out taking your bike along. The bus journeys through beautiful landscapes of countryside which in itself is a refreshing experience you don’t want to miss. Portland car service providers offer hourly chauffer service that start from $295 when travelling from Portland to Eugene. Choose from sedans, motor coaches, limousines and executive coaches depending on your requirement and let someone do the driving while you get to relax and enjoy the drive while indulging yourself in the picturesque beauty of nature which needs no mention. Chauffer services operate round the clock to cater to a wider market and this makes them an ideal choice among public transport. Save time on check-in and long waits in case of flight delays when you hire a chauffeur service. Transport solution giants like Enterprise Rent-A-Car offer car rental services to almost every part of the United States. They also offer trip planning when you discuss travel ideas with them. From cars, SUVs, trucks, minivans and vans, there is a vehicle to suit your taste and requirement. The rates for car rentals range from $ 40 to $ 60 a day for economy and full-size cars respectively. Premium and luxury cars are offered upon availability and needs to be checked with the customer service. Renting out a car gives you an edge on your trip as you are solely in charge of your trip plus you get to decide if you want to hire the rental service one-way or two-way with no obligation of being tied to a vehicle throughout the trip. Rental companies arrange for you to drop off the vehicle at a designated place in case you don’t wish to take back the car on a round trip. According to Google maps, the approximate time taken to cycle your way from Portland to Eugene is around 12 hours via the Willamette Valley Scenic Bikeway. This distance of 130 miles has an abundance of interesting places to visit with sufficient boarding and lodging facilities aimed at bikers venturing into this route. One of the main attractions frequented by bikers in this route is the McKenzie River, a 90 mile tributary of the Willamette River. This historic river is named after Donald Mackenzie, a Scottish-Canadian fur merchant who traveled these parts in the early 19th century while being associated with the Pacific Fur Company. The McKenzie River is especially popular for boating, fishing, kayaking and white water rafting. Its watershed is a perfect space to host sports like hiking and mountain biking on a 26.5 miles long trail. The river is enclosed in dense forest towards the west side and is home to the endangered northern spotted owl. Both Portland and Eugene have well-connected network of designated bike lanes and your bicycle could be just the right companion to get around the city as well. With public transports offering bike carriage service, you can hop-on and hop-off your bike as you explore the city. 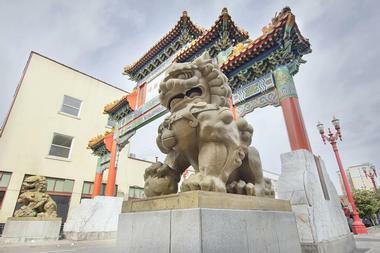 Portland is home to a plethora of art and artiste, was voted as the country’s 10th best Big City Arts Destination in 2006. It is a place that has bagged the awards “Greenest City in America” for its enviable lush greenery. Portland hosts several festivals throughout the year to celebrate beer and brewing - an event that specializes in rare and exotic beers like the Imperial Stouts, Barley Wines, Sour Ales and Barrel Aged Strong Ales collected from brewers from around the world. The occasion is further rejoiced with live music and local food. The city has an obvious obsession with lights as the Pioneer Courthouse Square hosts an annual Christmas tree lighting event that keeps the lights going on throughout the Christmas season. One particular street in the Sunnyside neighborhood named the Peacock Lane, will have decorated houses during the Christmas season. Further, visitors to the street are given a ride in horse drawn carriages to usher them into the locality. If you love to go wine tasting or if you are longing to see some of the most beautiful countryside in the world, steer onto highway 99W out of Portland south and all the way to Eugene. It is said that the true essence of Oregon is not experienced till you visit Eugene - a jubilant college city that is home to the University of Oregon; named after its founder, Eugene Franklin Skinner. Its well-connected public transport and dedicated bike lanes make it a pleasure to explore Eugene. The town is nicknamed as Track Town USA as its Amtrak depot is located in the heart of its downtown, a historic place surrounded by everything that is happening; from shopping to fine dining. A train journey to Eugene Station on the Willamette Street is all you need to experience the celebrations, markets and street fairs that keep this city young and euphoric. The city is a natural abode for picturesque beauty that is brimming with recreational opportunities like bicycling, jogging, rafting, kayaking and a passionate focus on arts. With a majority of its population being students from the University and the many colleges around, Eugene has materialized as a lively and community-oriented city that offers a lot of cheap and free activities to do. Fortunately enough, there is no need for a lot of money to experience all that Eugene has to offer.